The greatest challenge in compact NIR spectroscopy is collecting enough signal to achieve adequate SNR (signal to noise ratio). 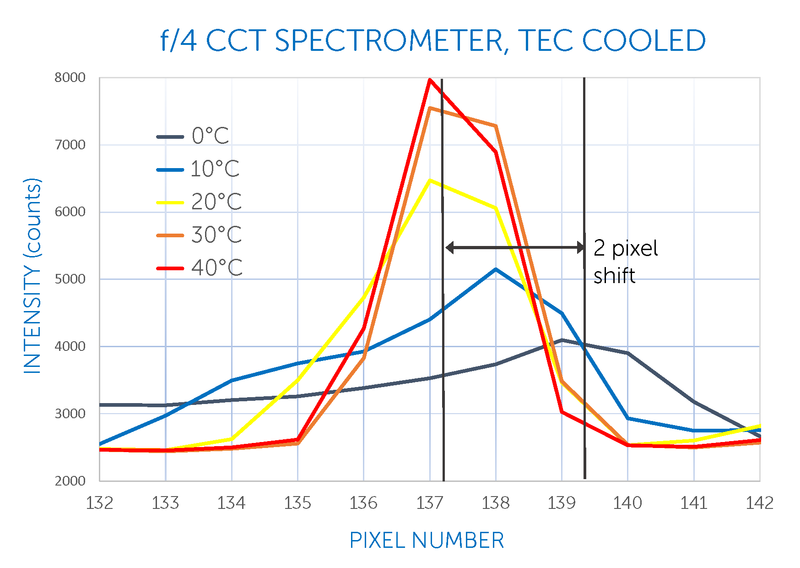 With many spectrometers on the market, it’s hard to know which has the performance needed. Here, we benchmark the superior sensitivity, data quality, and reliability of our NIR spectrometers. InGaAs diode array spectrometers are often light-starved, and require cooling of the detector to reduce thermal noise to an acceptable level. Increasing the acquisition time boosts signal, but results in more noise and compromises the practical speed at which measurements can be made. 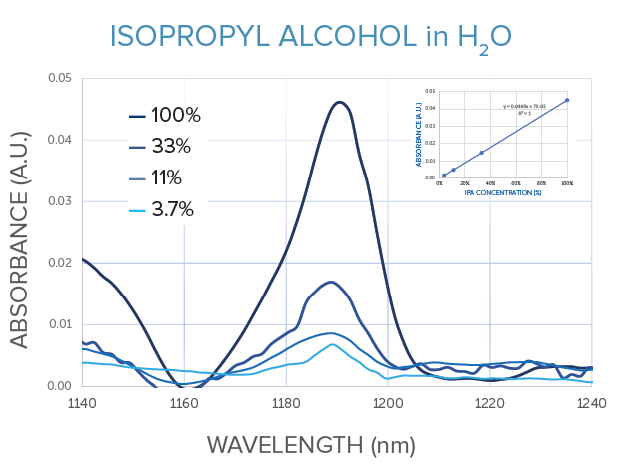 Using a better spectrometer is a simpler solution that improves spectral quality, LOD, and facilitates more accurate chemometric analysis. When we created our WP 1064 for Raman and broadband WP NIR, we boosted sensitivity in every aspect of the design, supported by the robust, thermally stable mechanics we know our OEMs need. With our own highly efficient volume phase holographic (VPH) gratings in a diffraction-limited transmissive design, these products deliver high quality NIR data in 1/10th the time of a typical cooled f/4 crossed Czerny-Turner (CCT) NIR spectrometer, and far more reliably. Photons are precious, particularly in Raman spectroscopy, which is why we designed and built an optical bench that allows you to capture, keep and detect more photons. 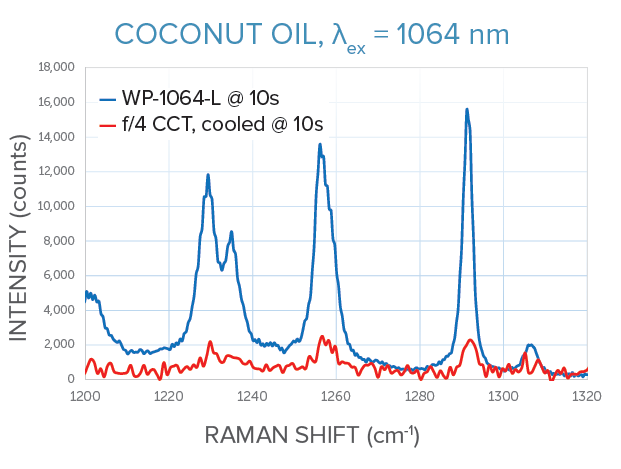 For coconut oil excited at 1064 nm at a fixed integration time of 10 seconds and 5 averages, our cooled WP 1064 Raman spectrometer detects >5x greater signal than a similarly configured f/4 CCT spectrometer with twice the slit size, for a total of 10x more signal. Bring your most challenging NIR measurements within reach with our high sensitivity. Increased sensitivity allows you to significantly improve the limit of detection (LOD) of your experiment. As a benchmark, we looked at absorbance spectra for dilutions of isopropyl alcohol in water in a 1 mm path length cuvette, 50 ms scan time. Our WP NIR I spectrometer yielded clear, linear data for concentrations down to 3.7% (and <0.01 AU! ), while a typical f/4 CCT spectrometer struggled to register peaks below 5%. With greater signal and less noise, we can help you see lower concentrations of analytes than ever before. Count on our products to speed your NIR measurements significantly. 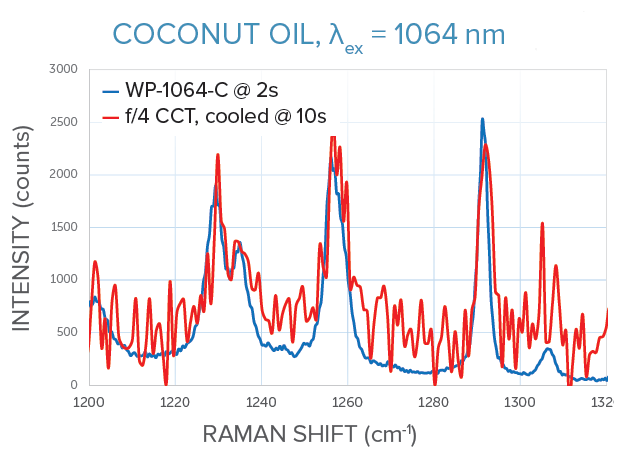 In a head-to-head comparison of spectra of coconut oil using our WP 1064-L Raman system with an integrated 300 mW laser, we acquired a strong signal in just 2 seconds, while an f/4 CCT spectrometer with twice the slit size took 10 seconds to register a much noisier spectrum with the same intensity (5 averages each). From high-throughput quality monitoring to point-of-care medical diagnostics, we deliver the answers you need in a fraction of the time. 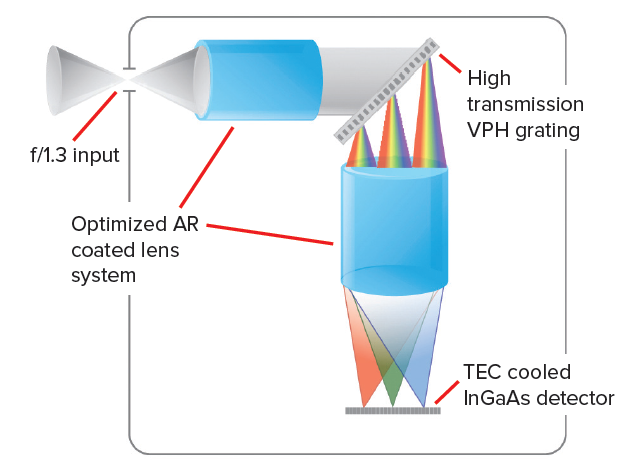 We place one of our own perfectly matched, patented volume phase holographic (VPH) gratings at the heart of each NIR spectrometer, using a transmissive design and aberration-corrected optics to keep every possible photon in the optical path. Our VPH gratings offer up to 40% higher efficiency, more uniform response with wavelength and polarization, and ultra-low scatter compared to reflective gratings. This alignment-robust design delivers the optimum in efficiency, manufacturability, and thermal stability for research or OEMs. Thermal stability plays a key role in NIR spectroscopy, determining the spectral reproducibility that is crucial to chemometric modeling. 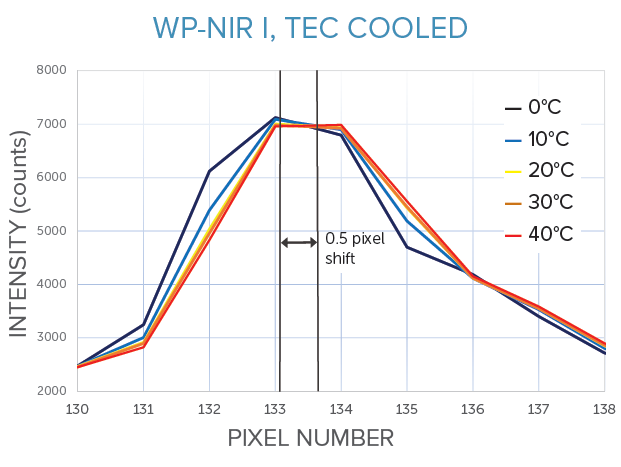 To validate our optomechanical design, we monitored Xe emission spectra with our WP NIR I spectrometer during temperature cycling, finding thermal shift to be 0.5 pixel over 0-40°C, compared to 2 pixels for a typical f/4 CCT NIR spectrometer. Our peaks also remain much more symmetric with temperature, giving you the thermal stability you need to achieve high accuracy in chemometric analysis. The inherent high efficiency, measurement speed, and thermal stability of our NIR spectrometers enables the most challenging NIR applications, from medical diagnostics to process control. Our team has worked with leading research groups and companies in pharma, food authentication, remote monitoring, and agriculture, and can offer you the expertise needed to make your R&D or product development successful. Contact us today!